Today’s article will be on the use of TiShadow within a development shop. Now, these are not all of the devices have for testing, this is just the ones I’m using currently. From top left we have Kindle Fire, iPad 2, Droid Pro, Nexus 7, iPhone 4s, Samsung S3 and a Droid X down in the front. 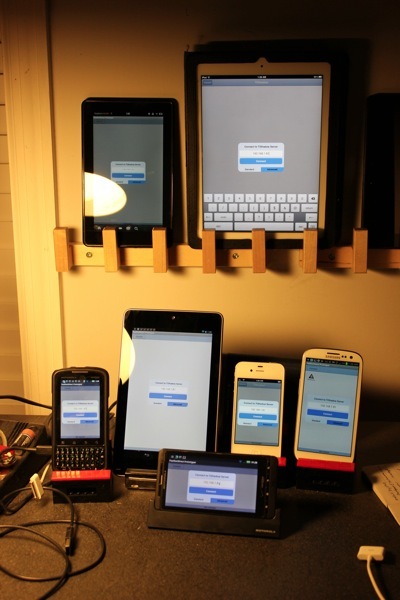 Now, can you imagine pushing a test to all of these devices? If you look closely, you can see that they all have the TiShadow client up at the connection screen. I figured the best way to explain the speed benefits would be to just show you. These have been built with the 1 second timeout but the binaries we make available to clients have a 15 second timeout to allow for problems with Internet connectivity. I wanted to give you a true feel for some of the minor issues that pop up from time to time. In the first part of the video you will see the iOS devices timeout. In the second part of the video, a few of the Android’s timeout. Part of the problem here is that I have data being uploaded to a client and my poor little Mac is taking a beating trying to do all of this at one time tonight. We work around this by increasing the time out in the client binary we use on a regular basis. The other thing to watch is just how long it takes that little old Droid Pro to kick in and run the application. The bottleneck on that particular devices is that it handles zip files poorly, a problem I can only assume stems from its processor. So you can see how easy it is to push changes out to a variety of devices to see how a modification may look on each. This alone saves time which, in the long run, saves money. But where else can this be used? We use it for presenting between development groups. Sometimes a screenshot just doesn’t do a designer’s work justice, or, sometimes it doesn’t make the designer’s idea look as bad as it really is. While a lot of UX may look good on paper, how many times have you discovered that what your team thought was a great idea just doesn’t work well on device? I can throw together some sample code and a developer on the other side of town connects to our TiShadow server over the net and I can push the code to his device and he can play with it live. No building a binary, no pushing it to Testflight or dropbox. It’s just done. So now we are reducing wasted time between development teams. The customer likes to see how a project is progressing. But getting a binary to their devices is always a complicated process. Yes, as geeks we know it can be done, and we have tools to work around the roadblocks, but how many of our clients really know much about their devices? We use Testflight to push an adhoc build of a customized TiShadow client. It connects to a client facing TiShadow server and with them on the phone, we simply push a sample of their project to their device. Eazy Peazy as some may say. So now, less frustration by our clients. Better communication. Quicker feedback. We would like to use Tishadow to show our customers how their projects are progressing but don’t know how to achieve it.